Our company Ask The Nepal Adventure pvt. 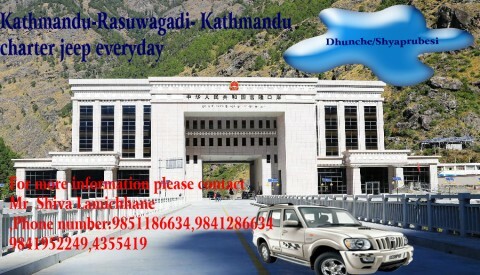 ltd. provides sharing and chartered jeep services from Kathmandu to Kerung Boarder as well as from Kerung Boarder to Kathmandu for those people who are travelling from Nepal to Tibet and Tibet to Nepal respectively. We provide luxurious jeep service with experienced local driver. We are proud to declare that our company has opened branch office in Timure, Rasuwa. So we can be contacted at our respective offices for jeep and other trekking services.